This off kilter romance started not in Marvel Diva’s #1 but in Black Panther #13 by Reggie Hudlin where the black super team of Photon, Drumm, Blade, Luke Cage and Black Panther came together to fend off Vampires hell bent on taking over the ravaged New Orleans. They met here and though Drumm was never the ladies man to begin with. He manged to fumble his way through asking her out. They had a lovely if boring date but after some vampires attacked them on the way home, hormones took over and they shagged like bunnies. They were apparently going steady after this while he was being earths master of the mystic arts. He was then promptly killed off…. here’s to what could have been! Of course it was. 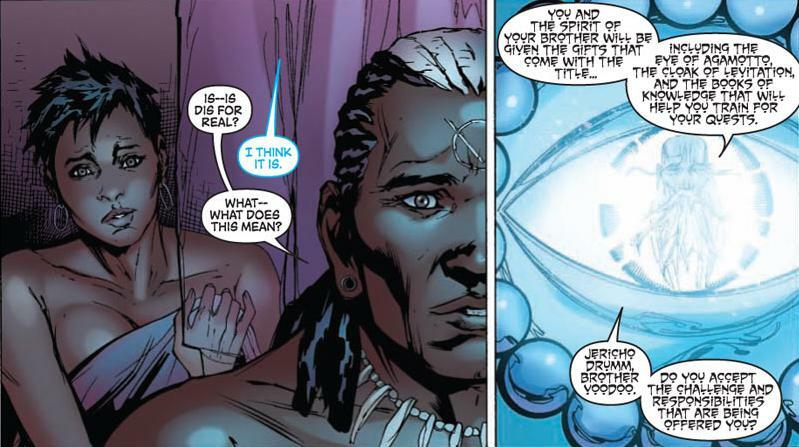 Two supremely powerful Black entities in the Marvel universe, connecting. They surely weren’t having that.